SATURDAY NIGHT, May 30th, the house churches of the Journey had a Gathering at Cambridge City Park to celebrate personal victories and healing. Victory never comes without a battle – so the two themes: war and healing, come together in our human experience. When it comes to addictions, (those things that take control of our lives against our better intentions) it often requires a true battle to evict them from the claim they have on our lives. These are the things that are “energized” by the Ephesians 6:12 struggle, not just with our own weaknesses, but against spiritual enemies, without bodies. Submission to God is only a first step when it comes to confronting these “strongholds” (2 Corinthians 10:4), we have to take a second step. James 4:7 states we have to also “resist”, as do Ephesians 6:13 and 1Peter 5:8. Few of us were taught this dynamic when we learned about Jesus, how ever we came to know about Him. Yet, about a third of Jesus’s ministry involved “resisting” these evil spirit beings, starting with Satan himself in the wilderness. We also see Him resisting the money changers in the temple courts with a camel whip. Not the classic “gentle Jesus” we see in the paintings. When He was resisting, He was never praying, so His example takes us outside of the teaching of even most current books out on the topic of “spiritual warfare”. In Jesus’s ministry, there was no such thing as “warfare prayer”. War was war, and prayer was prayer. 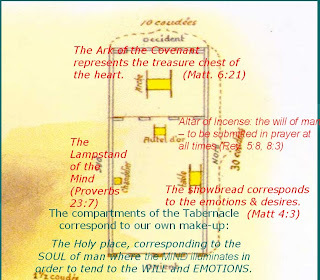 The teaching of Jesus ties the Tabernacle to our bodies as God’s intended home, and so its design reflects the blueprint of our soul. God’s idea of “salvation” gets real practical when we talk about removing any things that do not belong there, and inviting the Savior to set up housekeeping and start restoring and redecorating us – as His sacred place. How differently do we see our life when we consider that we have been made a “sacred place” – a temple of God Himself? Some of the words shared on Saturday night reflected the power of this truth. I think it is really God’s passion that we see ourselves and others as sacred places, made to be inhabited by God’s presence.